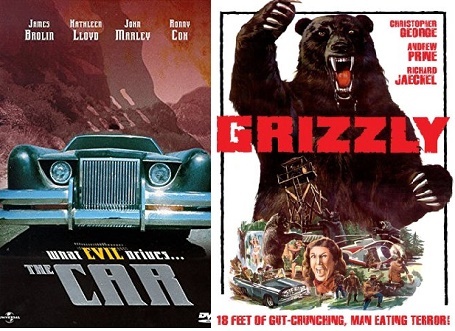 On this special episode of the Really Awful Movies Podcast…two movies “inspired” by the great JAWS, The Car and Grizzly. We’re gonna need a bigger boat…and we’re going to need a special guest too. We decided to bring back one of our favorite people in the horror community, a gentleman and a scholar, Scott Drebit from Daily Dead (who’s previously joined us to talk about all sorts of terrific eco-horror films) to chat about these two very similar films. If there’s ANY type of creature, from the slimiest little protozoa to the largest blow-hole spewing whale, that’s going around killing people…SIGN US UP. We really dig animal attack fare, and yes, The Car is a a killer sentient vehicle…but in the film, the title car still adopts the mannerisms of a predatory creature…huffing and stalking its human prey. And both films feature the killer POV as a car/grizzly hunts down victims. 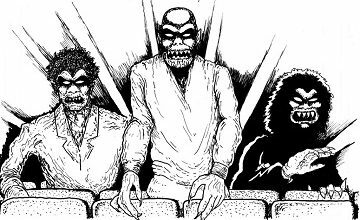 The 70s was a fertile time for horror, and it’s easy to forget just how weird and undeniably fun the films were. Ratings and how films were violent and yet easily accessible to the (younger) masses in the 70s.